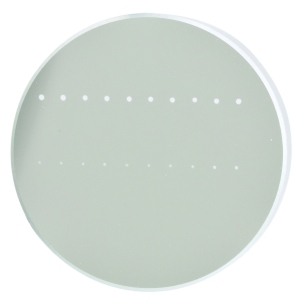 Thorlabs' Precision Germanium (Ge) Windows are offered in Ø1/2" and Ø1" sizes. 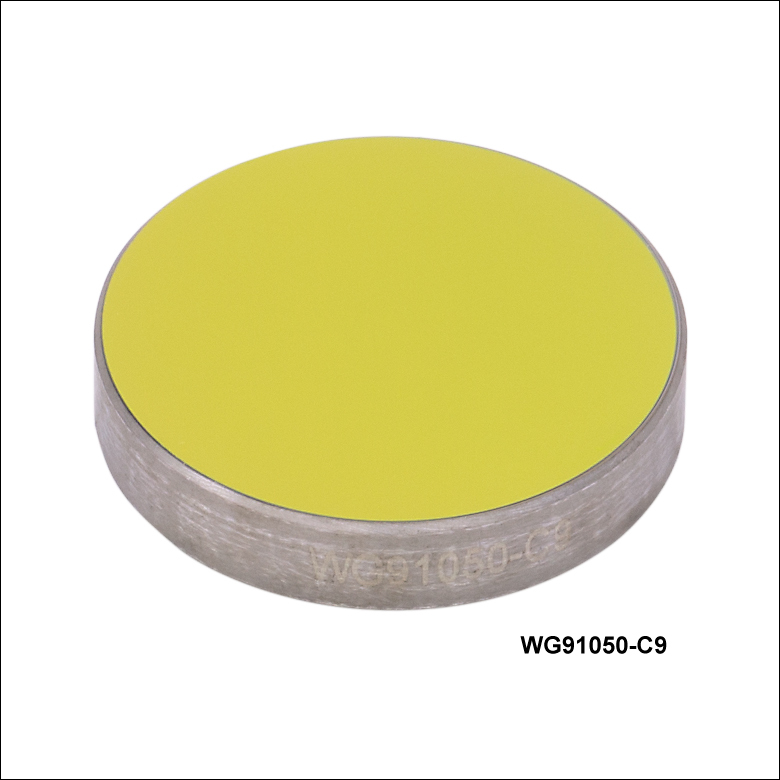 They are available uncoated or with an AR coating on both sides that provides <2% average reflectance from 1.9 to 6 µm (offered in Ø1" size only) or <1% average reflectance from 7 to 12 µm. See the graphs in the tables below for the transmission of our uncoated and AR-coated germanium windows in the IR spectral range, or refer to the Graphs tab for data extending down into the visible range. 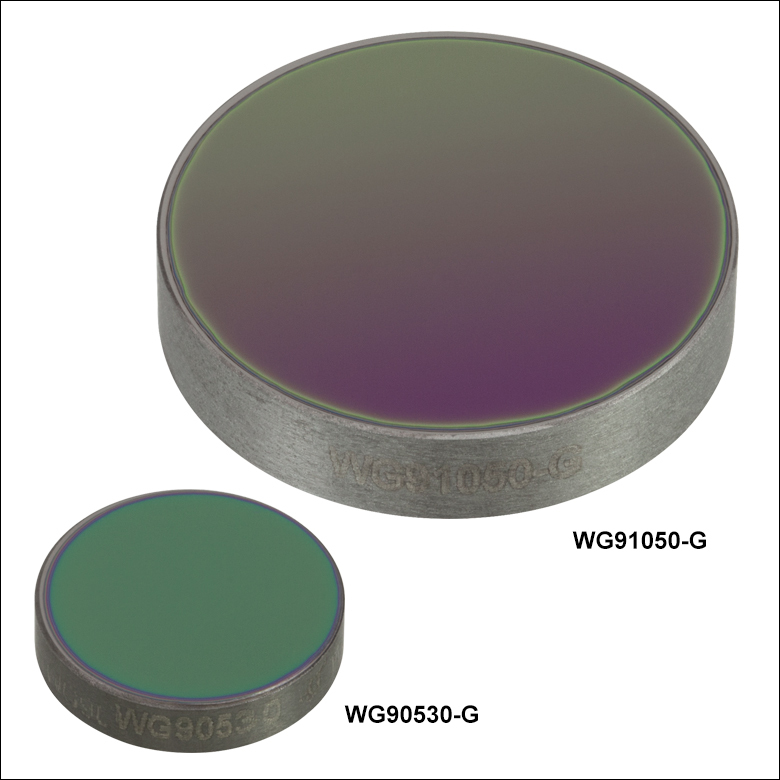 Due to its broad transmission range and opacity in the visible portion of the spectrum, germanium is well suited for IR laser applications. As indicated by the plots in the Graphs tab, germanium also acts as a longpass filter for wavelengths greater than 2 µm. In addition, germanium is inert to air, water, alkalis, and many acids. 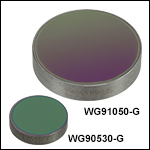 Germanium's transmission properties are highly temperature sensitive; in fact, the absorption becomes so large that germanium is nearly opaque at 100 °C and completely non-transmissive at 200 °C. When handling optics, always wear gloves. This is especially true when working with germanium, as dust from the material is hazardous. For your safety, please follow all proper precautions, including wearing gloves when handling these windows and thoroughly washing your hands afterward. Thorlabs also offers precision windows fabricated from several other substrates for use in a large variety of laser and industrial applications. For our complete selection, see the Precision Window Selection Guide table to the right. We also offer laser windows, which have AR coatings centered around commonly used laser wavelengths, and Brewster windows, which are designed to eliminate P-polarized reflected light. This graph shows the full scale measured transmission of an uncoated germanium window at normal incidence. This graph shows the measured transmission of an uncoated germanium window at normal incidence in the visible wavelength range. The values reported in the visible and near infrared are limited by the noise floor of the spectrometer used. Please note that out-of-band transmission is not monitored during production and will vary from lot to lot. This graph shows the full scale measured transmission of an AR-coated germanium window at normal incidence. The shaded region denotes the AR coating range, over which Ravg < 2% per surface. This graph shows the measured transmission of a 1.9 to 6 µm AR-coated germanium window at normal incidence in the visible wavelength range. The values reported in the visible and near infrared are limited by the noise floor of the spectrometer used. Please note that out-of-band transmission is not monitored during production and will vary from lot to lot. This plot gives the measured reflectance (per surface) at normal incidence of our 5 mm thick, AR-coated germanium window. The average reflectance is <2.0% per surface within the shaded wavelength range of 1.9 - 6 µm. This graph shows the full scale measured transmission of an AR-coated germanium window at normal incidence. The shaded region denotes the AR coating range, over which Ravg < 1% per surface. This graph shows the measured transmission of an AR-coated germanium window at normal incidence in the visible wavelength range. Please note that out-of-band transmission is not monitored during production and will vary from lot to lot. This plot gives the measured reflectance (per surface) at normal incidence of our 5 mm thick, AR-coated germanium window. The average reflectance is <1.0% per surface within the shaded wavelength range of 7 - 12 µm. The specifications to the right are measured data for Thorlabs' germanium windows. 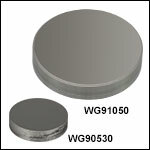 Damage threshold specifications are constant for germanium windows with the same coating, regardless of the size of the window. It would be great if you could provide much broader transmission plots. Often need to know the transmission in the visible so we can sneak in an alignment laser. Response from Sean at Thorlabs: Thank you for your feedback! We have added extended transmission plots down to 200 nm. Unfortunately, Ge does not transmit visible light. 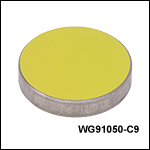 We also offer ZnSe windows, which do offer good transmsission in the infrared and visible regions (http://www.thorlabs.com/newgrouppage9.cfm?objectgroup_id=3981). We will continue adding visible transmission plots to our infrared optics in the coming months. Response from Tim at Thorlabs: Two possible options will be Ge and ZnSe. We will generate some data on performance with the –F coatings and contact you directly to discuss your requirements. Am looking for an IR window to effectively use as a beam splitter between LWIR and NIR bands. Ultimately, looking for a window/beamsplitter that can transmit LWIR 8-12um for one arm, and reflect NIR 1um for second arm. What window would be ideal for this application? Response from Tim at Thorlabs: Ge becomes increasingly more absorptive in the lower end of your spectrum and will limit transmission. I will contact you to provide updates as we accumulate data within this wavelength region with the -F ARC. Hello- Can you tell me what the R/T performance is from 1-2um (at least on an example run, if not well-controlled) at both 0 and 45 degree AOI? Response from Tim at Thorlabs: Thank you for your feedback. The resistivity range of the Germanium we utilize is 5-40 Ohm-cm. Also, we are able to offer custom coatings on some of our optics. I have contacted you directly to get more information. Can you please inform me if you can provide these Ge windows with diamond-like coating (DLC) on a single surface (and then uncoated or AR on the other)? Also, what is the allowed resistivity range of the Ge you utilize (in ohm-cm)? Response from Buki at Thorlabs: Thank you for using our Feedback tool. Yes, you can use these Germanium windows at a 45 degree angle to function as a beam sampler. Could we use this Ge window as a beamsplitter for 45 deg incident with a small mount reflection? We would like to find a BS for pump-probe system for around 8um. Thank you. Response from Javier at Thorlabs to mhlavach: We currently do not have information regarding the performance of our Ge windows in the 1000 to 1200 °C range. The coating process used goes up to about 100 °C, but we do not have any data at higher temperatures. Can germanium windows survive a combustion environment of 1000 to 1200C? Can you please report the surface reflection around 1um wavelength? Reflectance is given per surface and each window is coated on both sides.